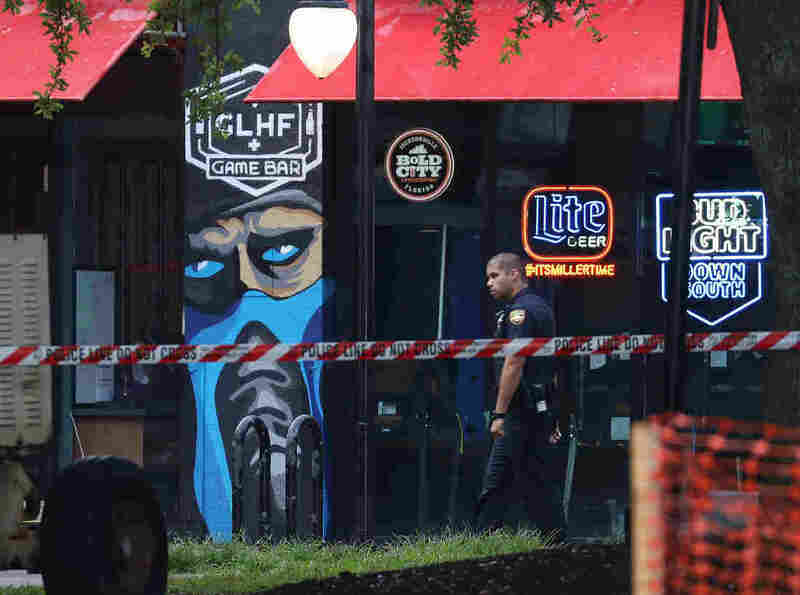 Madden Tournaments Canceled After Deadly Shooting In Jacksonville Two players were killed when a shooter opened fire at a Florida tournament. Police say the shooter took his own life. The CEO of game-maker Electronic Arts says he has canceled three upcoming events. A police officer walks past the GLHF Game Bar where three people including the gunman were killed at Jacksonville Landing on Sunday in Jacksonville, Fla. The CEO of game-maker Electronic Arts has announced the cancellation of three upcoming video game tournaments following a deadly shooting on Sunday at a Madden gaming event in Jacksonville, Fla.
Two Madden players – who have been identified as Taylor Robertson, 28, and Elijah Clayton, 22 – were killed when a shooter opened fire in the middle of the tournament. Authorities say a suspect who was also participating in the tournament, David Katz, 24, took his own life at the scene. Robertson and Clayton "were respected, positive and skilled competitors, the epitome of the players and personalities at the heart of our community," Electronic Arts CEO Andrew Wilson said in a letter to players and the gaming community. The event in Jacksonville was a qualifier for a competition called Madden Classic. "We have made a decision to cancel our three remaining Madden Classic qualifier events while we run a comprehensive review of safety protocols for competitors and spectators," Wilson said. The qualifiers had been scheduled to take place next month in Virginia, California and Texas. The gaming community is reeling from the sudden deadly violence at what started as a normal tournament of the football video game Madden NFL 19. "You could hear people crying," player and survivor Ryen Aleman told NPR. "You could hear people saying, 'I'm shot,' you can hear people tripping, trying to leave, scrambling everywhere, running for their lives." Clayton had scored a touchdown shortly before the shooter opened fire, NPR's Brakkton Booker reported. Robertson and Clayton were both killed, and multiple people were injured. Katz, the deceased suspect, is from Baltimore. He had a history of psychiatric issues, and court records show that his parents repeatedly attempted to obtain treatment for him, according to The Baltimore Sun. "David would go days without bathing, would play video games until 4 a.m. on school nights, would walk around the house in circles," Howard County Circuit Judge Lenore Gelfman stated in 2010, according to the newspaper. Katz "was failing all classes at Hammond High, was unresponsive to school teachers and uncooperative with school psychotherapists/counselors, and was extremely hostile toward his mother." Investigators have not yet determined a motive for the attack. Clayton, who hailed from California's Woodland Hills, played under the moniker TrueBoy or True and was described in his player bio as "one of the perennial top competitors in the scene." According to EA Sports, he was "known for his elite stickwork and ability to juke, spin and hurdle his way around opponents." And in addition to his football gaming skills, Clayton was a football star on the field in high school, according to the Sun. Robertson, from Ballard, W.Va., played under the name SpotMePlzzz and his player bio says he "has the skill to completely take over any Madden tournament." "He loved football, and out of all the videogames he could play, he settled on and mastered 'Madden,' " his cousin Brandi Pettijohn said in a family statement, according to The Associated Press. "He made a good living gaming, and he saved his earnings so he could afford to go to college to continue his education." She added that the family is "devastated by yet another senseless act of gun violence."